Public Restrooms Become Central To The Opioid Epidemic : Shots - Health News People often turn to public restrooms as a place to get high on opioids. It has led some establishments to close their facilities, while others are training employees to help people who overdose. A public restroom on the platform of the Central Square MBTA station in Cambridge, Mass., which people have used as a place for getting high. Eddie, whose last name we're not including because he uses illegal drugs, knows which restrooms along busy Massachusetts Avenue he can enter, at what hours and for how long. Several restaurants, offices and a social service agency in this neighborhood have closed their restrooms in recent months, but not this sandwich shop. "With these bathrooms here, you don't need a key. If it's vacant you go in. And then the staff just leaves you alone," Eddie says. "I know so many people who get high here." At the fast food place right across the street, it's much harder to get in and out. "You don't need a key, but they have a security guard that sits at the little table by the door, directly in front of the bathroom," Eddie says. Some guards require a receipt for admission to the bathroom, he says, but you can always grab one from the trash. A chain restaurant a few stores down has installed bathroom door locks opened by a code that you get at the counter. But Eddie and his friends just wait by the door until a customer enters the restroom, then grab the door and enter as the customer leaves. "For every 10 steps they use to safeguard against us doing something, we're going to find 15 more to get over on their 10. That's just how it is. I'm not saying that's right, that's just how it is," Eddie says. Eddie is homeless and works at a restaurant. Public bathrooms are one of the few places where he can find privacy to inject heroin. He says he doesn't use the drug often these days. Eddie is on methadone, which curbs his craving for heroin, so he only uses the drug occasionally to be social with friends. He understands why restaurant owners are unnerved. "These businesses, primarily, are like family businesses; middle class people coming in to grab a burger or a cup of coffee. They don't expect to find somebody dead," Eddie says. "I get it." Managing public bathrooms is "a tricky thing"
Many businesses don't know what to do. Some have installed low lighting — blue light, in particular — to make it difficult for people who use injected drugs to find a vein. The bathrooms at 1369 Coffee House in the Central Square neighborhood of Cambridge, Mass., are open for customers who request the key code from staff at the counter. The owner, Joshua Gerber, has done some remodeling to make the bathrooms safer. There's a metal box in the wall next to his toilet for needles and other things that clog pipes. And Gerber removed the dropped ceilings in his bathrooms after noticing things tucked above the tiles. 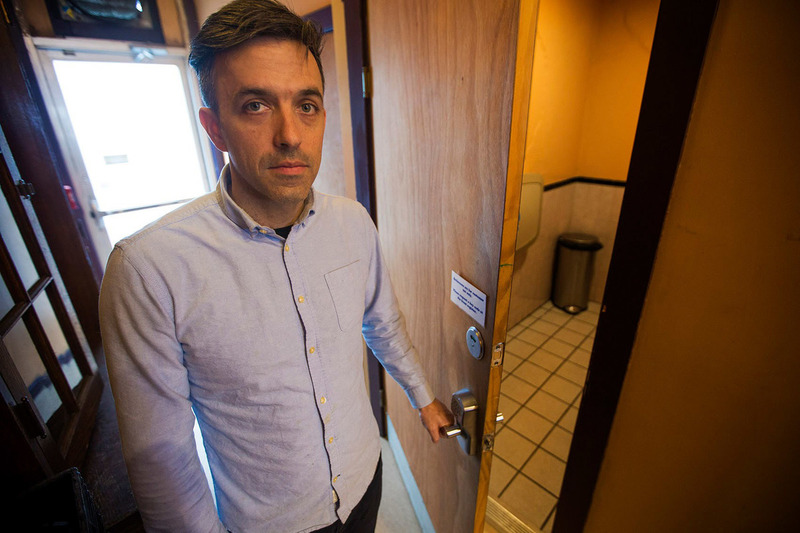 1369 Coffee House owner Josh Gerber opens the bathroom door, which has a combination lock given to patrons at the front counter. "We'd find needles or people's drugs," Gerber says. "It's a tricky thing, managing a public restroom in a big, busy square like Central Square where there's a lot of drug use." Gerber and his staff have found several people on the bathroom floor in recent years, not breathing. "It's very scary," Gerber says. His eyes drop briefly. "In an ideal world, users would have safe places to go [where] it didn't become the job of a business to manage that and to look after them and make sure that they were OK."
There are such public safe-use places in Canada and some European countries, but not in the U.S., at least not yet. So Gerber is taking the unusual step of training his baristas to use naloxone, the drug that reverses most opioid overdoses. He sent a training invitation email to all employees last week. Within 10 minutes he had about 25 replies. "Mostly capital 'Yes' exclamation point, exclamation point, 'I'll be there for sure!' 'Count me in!' " Gerber recalls with a grin. "You know, [they were] just thrilled to figure out how they might be able to save a life." Last fall, a woman overdosed in a bathroom in the main lobby of Massachusetts General Hospital in Boston. Luckily, naloxone has become standard equipment for security guards at many hospitals in the Boston area, including that one. "I carry it on me every day, it's right here in a little pouch," says Ryan Curran, a police and security operations manager at Massachusetts General Hospital, pulling a small black bag out of his suit jacket pocket. The woman who overdosed survived, as have seven or eight people who overdosed in the bathrooms since Curran's team started carrying naloxone in the last 12 to 18 months. "It's definitely relieving when you see someone breathing again when two, three minutes beforehand they looked lifeless," Curran says. "A couple of pumps of the nasal spray and they're doing better. It's pretty incredible." Massachusetts General Hospital began training security guards after emergency room physician Dr. Ali Raja realized that the hospital's bathrooms had become a safe haven for some of his overdose patients. "There's an understanding that if you overdose in and around a hospital that you're much more likely to be able to be treated," Raja says, "and so we're finding patients in our restrooms, we're finding patients in our lobbies who are shooting up or taking their prescription pain medications." Many businesses, including hospitals and clinics, don't want to talk about overdoses within their buildings. Curran wants to be sure the hospital's message about drug use is clear. "We don't want to promote, obviously, people coming here and using it, but if it's going to happen, then we'd like to be prepared to help them and save them and get them to the [Emergency Department] as fast as possible," Curran says. 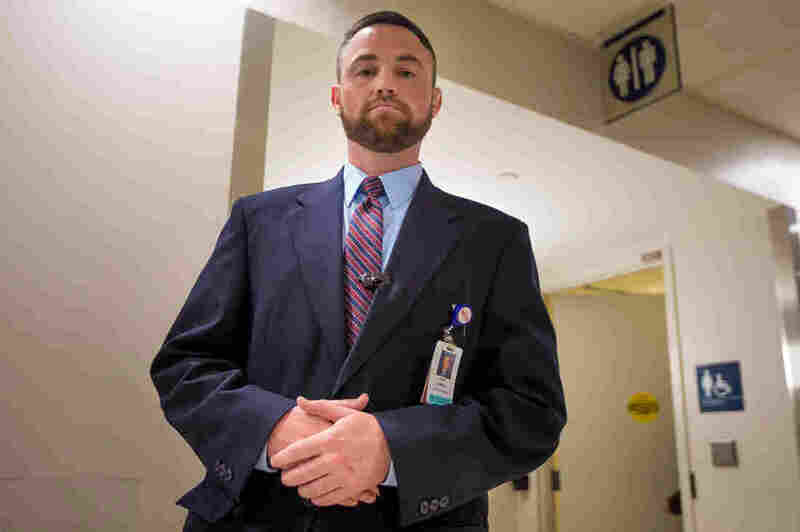 Ryan Curran, the day shift operations manager of police and security at Massachusetts General Hospital, stands in front of the bathrooms in the main lobby. Speed is critical, especially now, when heroin is routinely mixed with fentanyl. Some clinics and restaurants check on bathroom users by having staff knock on the door after 10 or 15 minutes, but fentanyl can deprive the brain of oxygen and cause death within that window. One clinic has installed an intercom and requires people to respond. Another has designed a reverse motion detector that sets off an alarm if there's no movement in the bathroom. There's very little discussion of the problem in public, says Dr. Alex Walley, director of the Addiction Medicine Fellowship Program at Boston Medical Center. "It's against federal and state law to provide a space where people can use [illegal drugs] knowingly, so that is a big deterrent from people talking about this problem," he says. Without some guidance, more libraries, town halls and businesses are closing their bathrooms to the public. That means more drug use, injuries and discarded needles in parks and on city streets. In the area around Boston Medical Center, wholesalers, gas station owners and industrial facilities are looking into renting portable bathrooms. "They're very concerned for their businesses," says Sue Sullivan, director of the Newmarket Business Association, which represents 235 companies and 28,000 employees in Boston. "But they don't want to just move the problem. They want to solve the problem." Walley and other physicians who work with addiction patients say there are lots of ways to make bathrooms safer for the public and for drug users. A model restroom would be clean and well-lit with stainless steel surfaces, and few cracks and crevices for hiding drug paraphernalia. It would have a biohazard box for needles and bloodied swabs. It would be stocked with naloxone and perhaps sterile water. The door would open out so that a collapsed body would not block entry. It would be easy to unlock from the outside. And it would be monitored, preferably by a nurse or EMT. There are very few bathrooms that fit this model in the U.S. Some doctors, nurses and public health workers who help addiction patients argue any solution to the opioid crisis will need to include safe injection sites, where drug users can get high with medical supervision. "There are limits to better bathroom management," says Daniel Raymond, deputy director for policy and planning at the New York-based Harm Reduction Coalition. 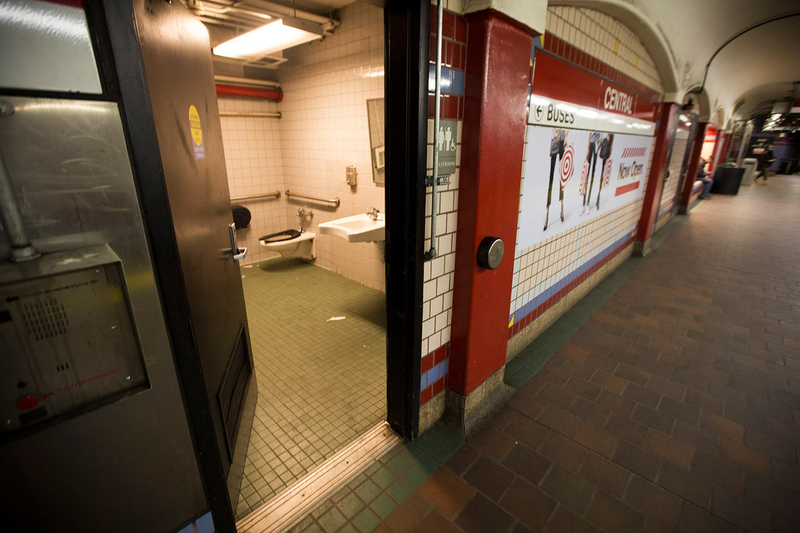 If communities like Boston start to reach a breaking point with bathrooms, "having dedicated facilities like safer drug consumption spaces is the best bet for a long-term structural solution that I think a lot of business owners could buy into." Maybe. No business groups in Massachusetts have come out in support of such spaces yet.